I never thought much of it till I came to Doha, and I definitely didn’t realise what an amazing ability it is till recently. The first time it hit me was when I went to an expat-group bazaar, where folks were selling trinkets and snacks from their home countries. Even for the simplest addition and subtraction either the calculator was whipped out, or fingers were pressed into service. These were well-educated, well-placed men and women from around the world. However, those from India and the Far East were doing complicated calculations mentally. Shall we attribute it to our education system? Or is it **jingoism alert** the brilliance of the race? How can we explain the ability of otherwise illiterate or semi-literate folks to do complicated mental calculations? Baalama is about 70 years old now. I’ve known her all my life, and her daughter, Anjalai, is the one who cared for me as a child, and subsequently my kids, and even now is the main support for my ageing parents. They cannot even sign their names. Baalama is the milk lady for the colony. She has about 20-30 clients. Milk accounts go into decimals, eg Rs 482.45. At the beginning of the month she would calculate how much money each household owed her. If on certain days neighbours traded milk bottles (before the day of private milk producers, a common practice. When one household had guests they would borrow milk from another that had excess), she had to deduct and add accordingly. She did it all, to the last decimal point, without ever using pen and paper. The same with Anjalai. She would go to the market and deal with the vendors who either like her never attended school or had the most basic education. But all her calculations, sometimes toting up purchases over a week, were done mentally. When I was living amongst these mathematically inclined brains, I hardly ever noticed how fantastic this was. Now I do. One explanation could be skill driven by need. Because they cannot use pen and paper, do not have access to calculators, they are forced to use what they have? 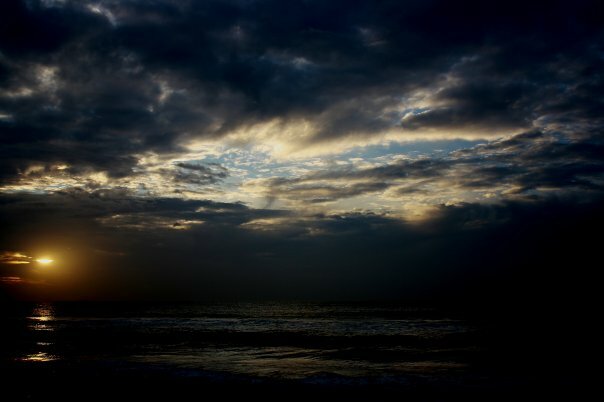 A pic my nephew GK clicked... cloudy skies, the beach, a hint of rain, sun and all things typically Madras. Read this post and got all nostalgic about the rain. The thing is, Madras rains are more a nuisance than anything else. From what I remember, with just a drizzle the drain pipes broke and the roads choked. When the real deal — blinding rain — set in, diseases abounded; water seeped through the walls; low-lying areas became inaccessible in anything but parisals and makeshift boats; electricity and telephone lines went bust; roads looked like the lunar surface and everyone cursed the corporation and politicians. Even after particularly wet years, where the Red Hills reservoir filled to the brim and over, Madras’s infamous water scarcity never seemed to resolve. And yet, how much we awaited the rains. How we loved it. Sheets of water washing away the city’s trademark sweat and humidity. My mind is a whirl of RAIN images, shoo-ing away sleep, and drawing me out of bed to post right away. There are unpleasant memories too, but in the spirit of the post I tag, I will stick mainly to the wonderful ones. Deepavalli. It always rained around Deepavalli. And my resourceful sister, C, would tie the stringed firecrackers to a long stick, dangle it out of the window and put up a show for us. My beautiful, sprawling Convent. We could smell the rain, even before the first drop hit the playground mud. Bajjis and masala tea. Hurricane lamps and candles at the ready. Black umbrellas, repaired many times over. And those flowered, imported ones in the ’90s. Huddling under a cheap plastic raincoat, while staring enviously at those with Duckback overcoats. Ceiling fans regulated at 3 for a change, instead of the max. Parisals. A famous film director’s office used to be in the colony, and one of these was left behind from a film set. 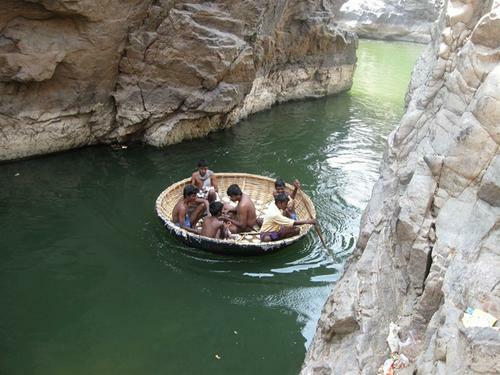 Every year, it was taken out to cart people from one end of the colony to the other. And that brings to mind, this wonderful song too: Rajnikant running towards Sridevi in Johnny. Taking long walks up and down the Ooty hillsides with my cousin M. Light drizzle and school girl confidences. Crushes and gossip. My first fall from the Kinetic Honda, while trying to avoid a worn-out, rainwater-filled part of the road. Getting caught on Mount Road on the way to work at Indian Express. My red & green bandini dupatta bought at Alsa Mall, staining and ruining my brand new white chikan-work salwar suit. My first kiss. On Elliot’s Beach, Besant Nagar, after the evening shift, late one rainy night (how dramatic! but true, nonetheless). Beat visits to the Communicable Diseases Hospital in North Madras, to check on Cholera deaths. Then to be pleasantly surprised by how well the hospital was maintained. Thunderstorms on the eve of my wedding. Then rains during the reception, which did nothing to reduce the huge numbers of people that flocked to the hall (my folks and I had an understanding – the wedding ceremony would be small, simple and at home; the reception would be on their terms). Cycling down the Law College road in Pune, undecided on whether to go back to the Film Institute hostel or join a bunch of my classmates on a very naughty and very interesting evening out. Finally choosing to cycle in the heavy rains towards the University Circle. Wet, confused, tired and stuffing my face with spicy vada pav from the shacks there. My first rains in Doha, within weeks of arriving here. Sitting alone and lonely in my ‘first home’, peering out of the window, missing Madras… And then running to the terrace to get drenched and feel better – to feel ‘at home’. Driving up to the Table Mountain in Cape Town, the rain beating a steady rhythm on the windshield. Then after the nth turn running into a rainbow view. What a sight! Waking up in the middle of the night to feed O (days old), and gazing longingly out of the verandah door, postnatal restrictions holding me back from running out into the rain. Taking a 1-year-old O out to the balcony in Doha to get wet. She looked so puzzled. Again when she was 3, dragged her out of school, to get wet. What joy! So worth skipping school. My first hailstorm, that too in Doha, 2 years ago! In 2008, driving to the Marina late in the night with my sisters and their kids and witnessing a mesmerising lightning show, far into the ocean. Fierce, angry and powerful, the dark sky was repeatedly ripped apart. It was an electrifying and deeply disturbing scene… what was brewing that far out there? … I better plug my memory for now. What’s your favourite rain recall? My golden brown cocker spaniel, with beautiful white strategically placed patches. By the end of his life, he was almost completely blind – inoperable cataracts, slower and was slightly hard of hearing. Otherwise, he was his usual lazy, undisciplined and loving/lovable self. It is a ripe old age for a dog – especially a retriever living in Madras. I am tempted to take a trip down nostalgia lane. Like when I was late returning home, an angry Goofy would wreck my room – torn scarves, upturned tables and an eyeliner bottle he had chewed (I still have it). I don’t want to think about the time when my sister, brother-in-law (V), nephew (GK) and Goofy dropped me off at work in (erstwhile) Express Estates, he jumped off to follow me in. Or of him lying on my old tees, after I left home and moved to Doha. Every summer, he would gulp down ice cream treats. He was by and large a vegetarian (milk, curd rice, dal, eggs), but for the beef biscuits. I don’t want to think about the many ways in which he was neglected either… not abusive neglect, just neglect because he was living with two other old beings who were just about managing to keep the machinery of home functional. He definitely deserved more walks, more brushing, more beach trips. He was never taught to sit or heel or turn over. He was never taught to fetch. Or rather he refused to learn. Except for my brother-in-law, we were not major dog lovers. We loved Goofy because he was ours. But he broke through all our reservations, and became a constant companion for my parents. At the beginning, he was my nephew’s pet, but since they lived in an apartment, they moved him to my parents’ slightly more spacious independent house – more specifically into my rooms and the adjoining terrace. After I left, a kennel was built for him in the coolest part of the compound, shaded by a neighbour’s coconut palms and our papaya and drumstick trees. V visited him last on Christmas night to console a crying and inexplicably restless Goofy. He wrapped him up in a blanket, tucked him in for the very last time, and went off to attend to my nephew who was very ill and hospitalised at that time. This post was actually supposed to be about my nephew… I am not religious, but I am kind of superstitious. I do believe that things happen in strange ways, and not everything has or needs an explanation or reason… I believe in genies and vibes. I believe in the power of hope. I spoke to my distraught sister on 25th December. My 19-year-old nephew’s platelet count was not rising as it should have even after infusion of six units. Dengue was suspected – even confirmed by doctors. That night his platelet count was still under 50,000. They were warned that he just could not afford a relapse. Ever. For the rest of his life. Early next morning, Goofy died in his sleep. As V and my dad were conducting Goofy’s burial, the most recent test results of GK’s came back. The platelet count was over two lakhs, he tested negative for dengue. My nephew was recovering fabulously and was being discharged. I don’t think I will ever have a pet again, because I am not really cut out to be a caregiver. Cats don’t cut it for me, because they are way too independent. So basically the happy medium between cats and dogs are kids, I guess! I am not a pet person. Then again, never say never. After the passing of my mum’s two dachshunds before she got married, she vowed the same – I guess pets have a way of choosing their families.